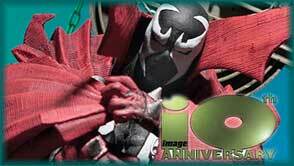 2002 is the big 10th anniversary of Image Comics. To celebrate this milestone, several of the Image founders got together at one of the legendary Image partners meetings and decided it would be cool for McFarlane Toys to release a series of action figures of four of the original Image Comics heroes. Thus, the 10th Anniversary Line was born and sculpted with a mix of comic artwork reference and our sculptors\' fine-honed sense of detail.